September 2008 (revised and expanded version Jan 2011). Tuku'e Yehadego was born in Asmara around 1942. He attended high school at Haile Selassie I secondary school, where he was a leading figure in the 1957 student strike against the imposition of Amharic as the school's language instruction. During the student demonstration in 1957 he hit a police captain with his head and was arrested. Tuku'e was also a soccer star player, after graduation he played with the Adulis Footbal Club and in December 1959 when the team was playing in Port-Sudan, he was recruited into the Eritrea Liberation Movement (Haraka). According Iyob (1995, 101) the Eritrean team, Adulis travelled to the Sudan for national matches, and three ELM members mobilized and recruited members for the new organisation. Killion (1997, 53) also adds that Tuku'e later helped organize the ELM in Asmara. Team members, like Tuku'e played key roles in spreading the network among the youth in Asmara in 1959 and he became a key ELM organizer in Asmara where he worked for Civil Aviation Authority. 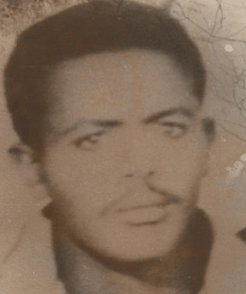 Tuku’e was also recruited the Eritrean Chief Police General Tedla Ogbit who was active in the assembly intimidating members and interrogated ELM (Haraka) members in the late 1950s. However, Tedla repented later and attempted to join the Eritra resistance movement this could be after he was recruited by the ELM. Because of this development (connection) when Tuku’e was arrested for organising a demonstration against Eritrea ANNEXATION in late 1962 he was released by Police General Tedla Ogbit. The death of Kidane caused much disillusionment among the ELF fighters. For example Tuku Yehdego who was one of the founders ofMahber Mahber Shew'ate (Union of Seven) in Asmara in 1959 became disillusioned. Tuku hated the Kiada al Ama leadership from the beginning and decided to work with the Sabbe group rather than to join Selfi Nsenat which was led by Issayas who was member of Kiada al Ama until he defected to theAla groups on 27 April 1970. After Tuku left the ELF, he sent a letter to the Eritrean students and other former members of Haraka in the Diaspora to inform them about the unstable political situation in the ELF and the Kiada Al Ama conspiracy to kill Kidane Kiflue and other fighters. His letter might have contributed for the split among the Eritrean students in the diaspora at the meeting of General Union of Eritrean Students (GUES) in Munich in the summer of 1970. One group was, which had Dr Fitsum Ghebreselassie, Aregai Habtu, Habte Tesfamariam etc condemned the Kiada al Ama action and the other group, which had, Herui Tedla Bairu who didn't condemn the killing of Kidane Kiflue and Wlday Giday. In 1971 when Dr Fitsum Ghebreselassie was killed in the ELF, Herui Tedla Bairu was a vice-chairman in 1971. The killing of Dr Fitsum Ghebreselassie might have a connection with the summer meeting which was held in Munich . [Herui was also participated in the decision to liquidate the EPLF in1972 which caused for the death of 3, 000 fighters from both side between 1972 and 1974. This was another crime which committed when he was in the ELF leadership between 1971 and 1975.]. It is beyond the scope of this paper to explore this issue in greater depth. However, according to a reliable source Tuku'e did not die in the civil war but there was a story that he mysteriously disappeared while he was with Girmai. As history proves Issays has never hesitated to eliminate any one who is more famous than he or a threat to his power and Tuku’e became one of the victim. Girmay Filipos in his paper “ኢሳያስ ሰላዪዶ ወይ ተጋዳሊ also mentioned that Tuke was killed by the EPLF not ELF.